It’s been a while since I posted (I’ve been super busy! ), so I will introduce myself really quickly. I’m Angel, the person behind the wheel of the Games Omniverse mega-bus. I founded the company and have funded it from the start. You might say it’s my baby, though many others have put so much work into it that I certainly can’t say it belongs only to me. I am a very lucky woman to have found such talented, skilled, and enthusiastic collaborators. We’ve been working on this game for a little more than two years, in our spare time. In our spare time because everyone on the team also has a day job. That’s the reality of indie game development. It takes a long time because few indie companies can afford to hire a studio of full-time employees. In those two years, we’ve completed about a third of the game. I believe we will finish the other two thirds over the next 12-18 months. I know…the math doesn’t add up. But, there are many tasks early on——not to mention a huge learning curve——that make things go slower. We are gaining speed and the team is stronger than ever. Why do I lose programmers? Well, usually because they get a new job or get crikey-busy at their current one. Programming takes so much energy and focus that it must be hard to hold down a mentally-taxing day job and do programming at night as well. I feel for them. 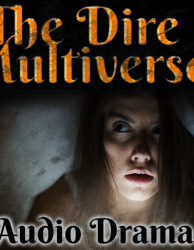 It’s a lot like spending your day writing and story-crafting for a ginormous MMO, then at night, going home and trying to write about a young school teacher who has her world turned upside-down (wink!). For this reason, I mostly write on the weekends when other people are recovering from their day jobs. Not all programmers are willing to work 7 days a week. I also lose them sometimes because they didn’t notice we’re doing a 2D game, because they don’t really know how to do what they said they could do, because it turns out to be more work than they imagined for the low pay, or because they just get distracted with life (marriages, babies, moving, illness, deaths… all those big life moments). I did, however, find the perfect place to find programmers if you’re looking. 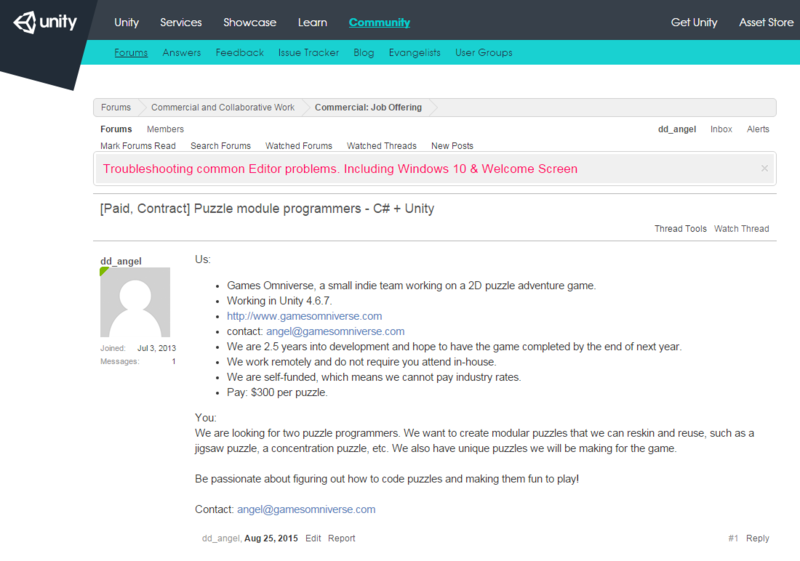 I placed an ad at the Unity’s Job Listing forum. Programmers of all sorts hang out there, so you don’t even need to be developing in Unity for it to be a useful connecting point. And I received over a dozen submissions. Of those dozen, ten signed the NDA. Of those ten, two have signed the contractor’s agreement. And two have tried to pitch me their own game. My goal was to hire three programmers, so I haven’t yet hit my mark. I’ll keep trying. The applications are still trickling in, so our perfect match may just be late. I’ve posted a copy of the ad so you can see how I wrote it. The applicants have come from all over: Baltimore, Spain, England, Israel, and Puerto Rico, just to name a few. That’s one of the things I’ve loved most about indie development. I love working with people from all over the world. We sometimes have language troubles, but I’ve learned to recognize from the emails they send me whether that’s likely to happen or not. I’ve seen moments when a misunderstanding could have really put a monkey-wrench in the production, but because I knew the person wasn’t a native English speaker, we were able to work it out. I hope it’s especially good for people from second-world countries to be able to practice their skills and earn some cash in ways they couldn’t before the Internet. I am happy knowing that Games Omniverse is giving these people a chance to get a shipped-game credit on their resumes and to build a network with people who will perhaps help them with their careers one day. Next time, I’ll talk a little bit about why we made the “Welcome Women Gamers” icon. Because games aren’t just for teen-aged dudes anymore! If you would like to talk about hiring programmers or anything else, visit our forums! I’d love to hear from you and I will answer.